"From a distance they appeared like many another religious building but on closer inspection they were found to be manufactured in one of the most modern materials of the time: corrugated iron. In their heyday they were the life blood of the small communities they served. 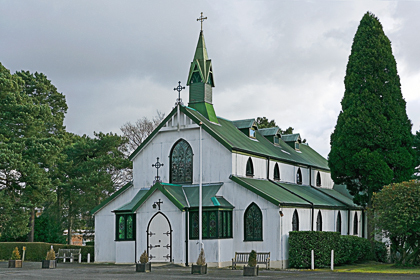 These industrially made Tin Churches rang out to the sounds of the great religious revivals over a period of several decades but the first world war spelled the beginning of the end for many of them." and "Construction of these churches ranges from the simplest rectangular hut to incredibly ornate attempts at replicating grand 'high church' architecture using the simple wooden frame clad in corrugated iron. Most mission chapels were bought in what we would recognise today as self assembly flat packs." Smith provides a broad overview of the heyday, use and disuse of corrugated structures from the last years of the C19th using photographic and other records up to the present day. The great revivalist movement with soaring congregations fuelled demand for places of worship. Congregations often raised funds, purchased and erected such churches themselves. Hook in Hampshire is one example where in 1886 an Anglican Church known as the "Tin Church" was built to serve the growing hamlet and offer an alternative to the long treck to worship in neighbouring villages. "The History of St John The Evangelist Parish Church Hook 1938-1998" states the parish "..had an iron Church constructed.. ..by Messrs Gowers who ran the nearby iron foundry.. ..took only three months to build.. ..cost £230.. .. was known as the 'Tin Church' 'Tin Tabernacle' and 'Mission Church' "
The Tin Tabernacle served the congregation for over 50 years until St John's Parish Church was built. 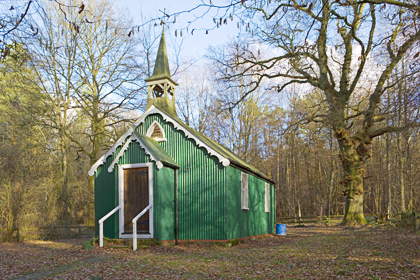 The prefabricated Church known in Henton as the 'little tin church' now stands in the Chiltern Open Air Museum which rescued and re-erected the Church there in 1994. These structures were designed to be readily moveable and some were exported overseas. According to the Museum the original agreement allowing erection of the Church at Henton required that it be made of iron and thus removable at short notice. It was supplied by Boulton & Paul of Norwich. Here two members of the Living Social History Group in authentic Victorian garb stand in front of the Church during a weekend in which they brought life back to the buildings on site. This scene is of the tranquil moments before the Brimstone Preacher is Arrested. The Museum has recreated the interior lay out with 50 wooden chairs arranged in rows on both sides of the aisle looking towards a small simple altar. From time to time the Church celebrates events in the Christian calendar such as Harvest Festival. An abridged version of John Morley-Clarke's (former Assistant Curator of the RAOC Museum) account is - the garrison church was named St Barbara's after the patron saint of the Royal Army Ordnance Corps. Built at Deepcut in 1901it served units stationed at Blackdown and Deepcut. In 1905 one acre of land adjoining the church was consecrated and Daisy Mason, the young daughter of a soldier was the first person buried there followed by members of various Regiments stationed locally as can be seen from existing gravestones. Electric light was installed in 1911, the first marriage held in 1934 and following WW2 various commemoration services with the Church continuing in regular use today. The Church is now a Grade 2 listed building. 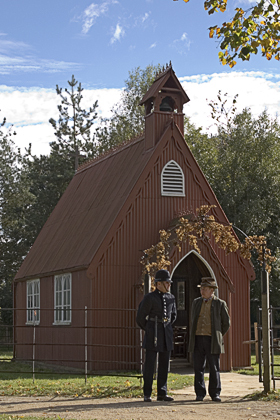 It is one of the larger "tin tabernacles" complete with stained glass windows. It took 5 days to build in 1883 providing a mission church for the gypsies who camped in the woods at Bramdean Common. It was built when the Christian mission was fervently keeping pace with change and new concerns arising from the industrial revolution. The Church is still used and on my visit (2006) had its graves well tended. Surrounded by a wooden fence marking out a clearing in the woods its corrugated skin is still in relatively good repair. The Church is used occassionally today and still popular with Romanies. The last group of people to live in these woods were the Dongas road protesters in the 1990's who were driven off Twyford Down and onto Bramdean Common when the M3 was finally cut through the downs near Winchester.